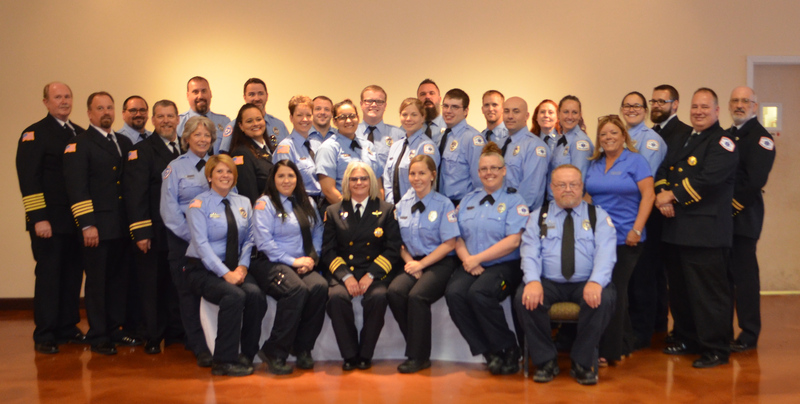 Warren County Ambulance District staff and Board of Directors are proud to provide Emergency Medical Services to the citizens of Warren County Missouri. The district covers approximately 250 square miles of Warren County with six Advanced Life Support ambulances and one mass casualty incident (MCI) trailer. There is a six member elected Board of Directors that governs the district and the administration staff that oversees the day to day operations of the district. The current Chief Executive Officer, Tim Flake, has been employed with the district since 1994. Chief Flake assumed the position upon the retirement of Chief Ralph Hellebusch in 2018, after 36 years of service with the district. The district currently runs day to day emergency medical calls out of four bases in Warren County. Base 1 and Base 3 are located north and south of Interstate 70 in Warrenton, Missouri while Base 2 and Base 4 are located in Wright City, also north and south of Interstate 70. Daily operations and administration of the district are managed by six members of the administration staff overseen by Deputy Chief of Operations, Mike Eskew and Deputy Chief of Human Resources and Information Systems, Darren Lenk along with and Executive Assistant, Training Officer, Patient Account Manager, Patient Account Billing Clerk and a full time Property Manager. Chief Eskew and Chief Lenk have combined service tenure of more than 40 years at Warren County Ambulance. The emergency medical service calls, topping more than 4,000 annually, are covered by a staff of 27 paramedics and 11 EMT-B field personnel. The district operates off of tax revenue and service fees. The current tax rate of .4999 on each $100 assessed valuation was passed by voters in April of 2014. The district does participate in the Medicare and Medicaid insurance programs and accepts assignments of these insurance companies. The district’s medical control is based out of SSM St. Joseph Hospital West in Lake St. Louis, MO. The district transports to the medical facility of the patient’s choice, providing their medical condition is stable and their choice of hospital is willing to accept the patient. The district paramedics operate under the control of the emergency room physician. Warren County Ambulance District is licensed through the Missouri Department of Health and Senior Services, Division of Health Standards and Licensure and the Bureau of Emergency Medical Services. The district is also licensed as a training entity through the Missouri Department of Health and Senior Services and Bureau of Emergency Medical Services. The district and the employees of the district are in compliance with the Health Insurance Portability and Accountability Act (HIPAA). A copy of the district’s Notice of Privacy Practices is available to every patient as they are seen.